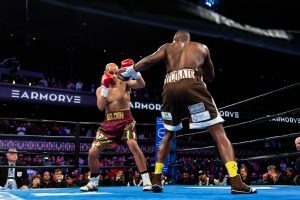 Questions about the future of the Super Middleweight division were left unanswered on Saturday night after the bout between Caleb Truax and Peter Quillin was declared a no contest after the second round. A clash of heads, initiated by a Quillin lunge, caused a cut over Truax’s eye in the middle of round 2. From ringside, it looked like Truax knew a stoppage was inevitable almost immediately after he was cut. A river of bright, red blood streamed over his eye and down his nose throughout the rest of the second round. The doctor’s decision to stop the fight was not a surprise, but it meant that over 4,000 fans left the arena without seeing their hometown hero land a meaningful punch. PBC has already booked a date at The Armory in Minneapolis for mid-July with Jamal James (25-1-0, 12 KOs) as the only fighter announced for the event. Maybe Truax and Quillin will try again in mid-July, but it is unlikely that Plant will wait that long to defend his title. Earlier in the evening, Sergiy Derevyanchenko (13-1, 10 KO) outpointed a sturdy Jack Culcay (25-4-0, 3 KOs) in an IBF title eliminator match at 160 lbs. The victory keeps the Ukrainian fighter in the mix for the IBF belt. Joey Spencer (7-0-0, 6 KOs) won an underwhelming decision in a fight where he was supposed to shine. Osias Vasquez (4-2, 0 KOs) was no match for Spencer, but he made it the distance and frustrated his opponent throughout the six rounds. Money Powell IV (10-0-0, 6 KOs) made the most out of his opportunity and delivered the strongest performance of the evening. The 21 year-old looked sharp and showed tremendous potential in his TKO victory against Christian Aguirre (8-5-0, 4 KOs). He started slow, but built momentum by firing impressive combinations that Aguirre could not handle. Look for Powell to appear in the televised portion of future PBC on FS1 events.